IDF holds graduation ceremony for soldiers in the 'Special in Uniform' program's new dogs (K-9) unit. 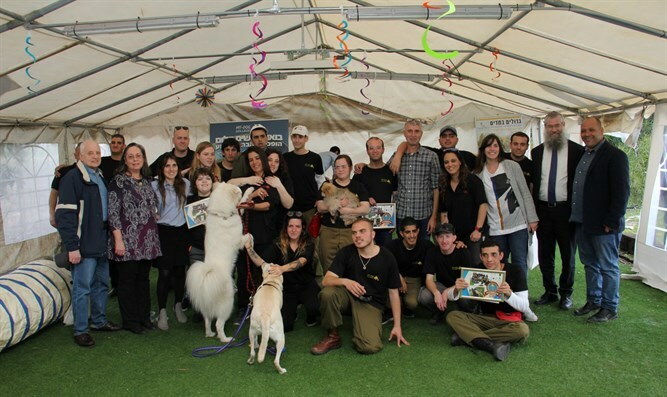 For the first time, young people with disabilities will be qualified to serve in the IDF working with dogs. At the end of their lengthy training, 20 young people with special needs concluded their training course with a presentation of the dogs' skills, and thereafter performed a full independent exercise. SIU matches the soldiers with positions, units, and commanders to ensure that their service is meaningful and effective. The organization identifies appropriate positions for each soldier to ensure each can excel in their tasks and have a sense of belonging. Throughout their service, “Special in Uniform” soldiers receive life-skill lessons and are provided with career assistance and placement to ensure a smoother transition into civilian life. Amir, a young adult with a diagnosis of high-functioning autism, is one of the program participants. Course participants developed the attitude and ability to treat dogs, directing a dog, operating dog kennels, cleaning, feeding, and maintaining open space. The program is conducted in an inclusive, systematic, and tolerant way. All the content was adapted in advance by preparing a profile of the young persons, together with their instructors. Each subject has been taught in a formal way, integrating simple theory, and made accessible by defining time-frames of a maximum of 15 to 30-minute modules at every learning session. The young people practice these tools systematically every week until they achieve full independence as much as possible in logistical activities. With the completion of the course, the new participants will now be stationed in different IDF and police bases, working with guard-dogs, detection dogs, and search and rescue dogs.